Yes! Yes! 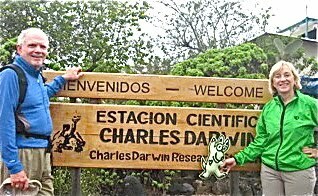 I traveled to Galapagos off the west coast of Ecuador with two of my dear friends, Bob and Gina. They took me on their adventure to "Tortoise Land"! 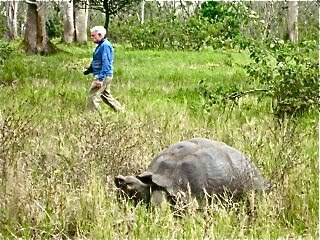 There goes Bob trying to outrace the tortoise. Who do you think won? The Tortose and the Hare. I feel so fortunate to have such great friends like Gina and Bob who take me traveling with them. I guess I'm not too much trouble; I sleep a lot and never bark! Most importantly, I always have a very postive attitude. Guess that makes me a good companion. What do you think? 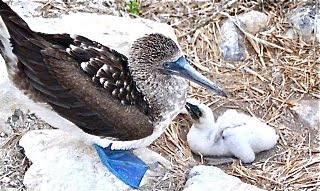 The blue-footed bubi/booby is one of the most well-known birds on the Galapagos Islands. 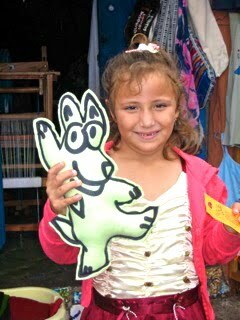 This three pound seafarer is clumsy on land and was named the "bubi" because it means "clown" or "stupid" in Spanish. 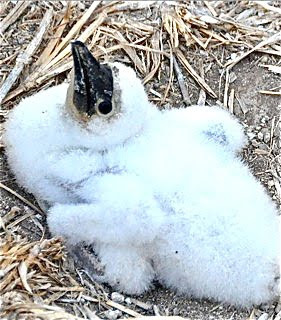 I think a kinder word would have been a nicer name for this unusual bird. Do you agree? I like kind words! 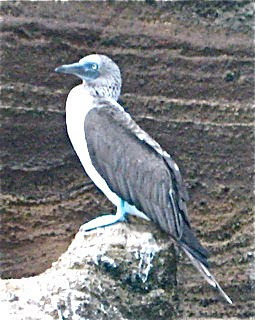 Now what's really cool about being in the Galapagos Islands is the fearlessness of the animals. They are not hunted or hurt, so humans can get very close, dogs too! 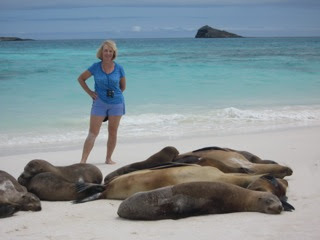 See how close Gina is these seals and not one is budging. 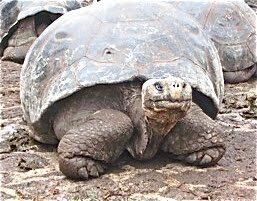 This is the Postmistress of the Galapagos Islands. Do you see that mailbox behind her? Well, long ago, residents put letters in the box hoping that when sailing ships stopped here, the vessel would be heading in the direction of the addressee. That's how the mail would get delivered, a sailor would take the letter to its destination. This little girl, Angie, a resident of the Galapagos, was all dressed up in her party clothes because her grandmother was taking her to lunch in the village. She was happy to meet me and really wanted to keep me, but I had to move on. Did you notice the loom for weaving in the background? Bob and Gina were part of a group touring the Galapagos. 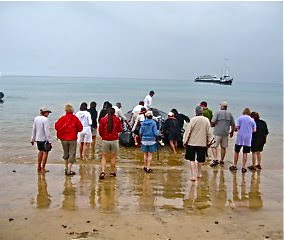 The whole gang is hopping into the Zodiac and motoring back to the National Geographic research vessel on which they spent the nights. 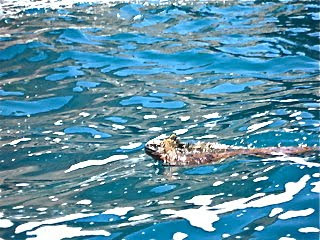 But, uh oh, they had better be careful-----that's a marine iguana in the water. Hold me tightly, Gina, I don't want to be that reptile's dinner! 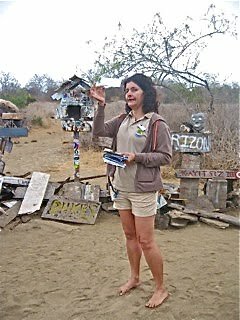 Well, what an adventure I had on the Galapagos. We put out from Ecuador and now we're back. 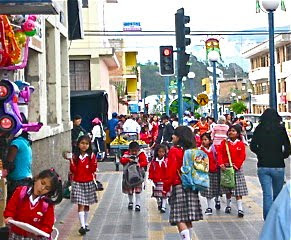 This is a group of girls just getting out of school. They sure look a lot different from the students in my neighborhood who wear surf gear! 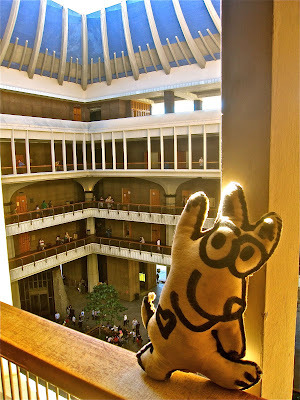 I just love traveling and looking for adventure and learning new things! Thanks to Bob and Gina for taking me! Welcome our new Legislator----Senator Donovan Dela Cruz. He represents District 22 which includes the North Shore! This public servant was on the City Council for years and is now working at the State Capital for my neighborhood. I loved the leis-- necklaces of flowers for celebrations. Isn't Hawaii wonderful! Donovan's smelled heavenly; the white ropes of pikake and the green maile leaves perfumed the air! Heaven to my little doggie nose! That's Dane Wicker in the suit who is Sen. Dela Cruz's Clerk and Albert, a volunteer. 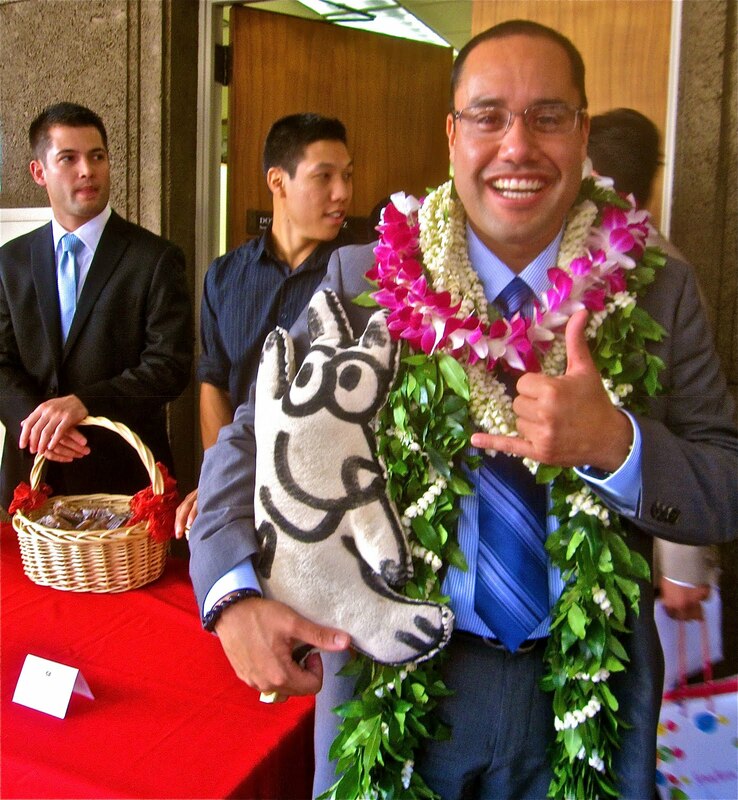 They were passing out granola brownies to the many visitors at the 2011 Hawaii Legislative Opening. I'm on the fourth floor of the State Capital. I love this building-----with an atrium in the middle, it's gives the building such a feeling of openness---hopefully, open minds and open hearts, too. I'm wishing the Legislators well this session. Now, if you want to know what's going on-----who's who and what's what------this is your destination. This room provides you with all the information about the status of bills, Legislator's calendars, hearing schedules, etc. 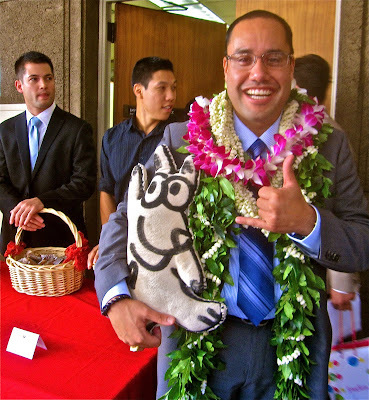 This is Jim Manke, a former newscaster and host at Hawaii Public Radio. He'll be working in the Public Access Room at the Capital to answer all questions, assist in testimony preparation, access documents, and so much more. Just look at the computers that are available to the public to keep track of what's going on. Drop in during the session and make yourself at home. Get involved! Exercise your rights as a citizen in a democracy! I would if I could, but remember, I'm just a little dog! Watch the Opening Day on T.V. Edgar is the ESL and media teacher at Waipahu Intermediate. He brought his students to the State Capital to interview their legislators and get to know the individuals who represent their neighborhood. The kids were having lots of fun! So I interviewed Edgar, and one of his students interviewed me!! Watch for the show on FOCUS, Channel 49 on 2/2/11 at 8 am, 2/4/11 at 1:00 pm, and 2/11/11 at 11:00 am. It will play on VIEWS, Channel 54 on 2/4/11 at 6:00 pm. I'll be watching, will you? 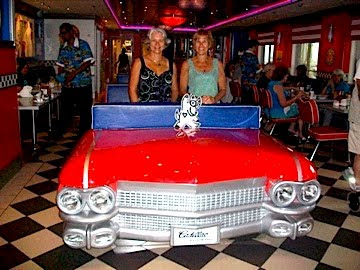 The Big Cruise--Come on Aboard! 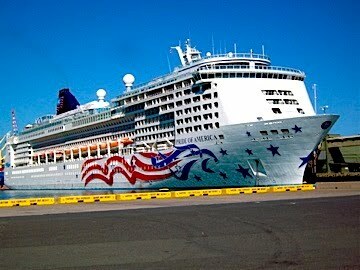 I'm going on a "ship trip" around the Hawaiian Islands on the Pride of America, a Norwegian Cruise Line vessel. As I was touring the ship, getting ready to depart, I noticed this life ring on the railing. So......I'd better be careful and stay on the boat or one of the other passengers will be tossing this to me! Here is Lyn who accompanied me while on my cruise. She likes to laugh and make jokes, so we had a swell time together. That's the Aloha Tower at Honolulu Harbor in the background. This port is famous---it's where all the ships from around the world have been coming since the first vessels sailed into Oahu. Now one of the best things about a cruise ship is all the fussing the staff does to make sure you are happy. These are my towels in the shape of an elephant-----every day the housekeeping staff would make my bed and create a new animal! Now isn't that fun! 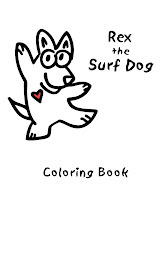 I wonder if they'll be making "Surf Dogs" for passengers in the future? This is my other traveling companion, Carolyn, and doesn't it look like she's having fun! This contraption is called a "Gyroscope" and it's just like an amusement park ride. There is always someone from the cruise staff monitoring the gyroscope just to make sure you don't overdo it! Did you notice the giant pool in the background? Now this is what I call "livin' in style"! Toys everywhere! Playtime all the time! Look very, very carefully. I had to studying what was happening on that big, blue boat in Kahalui Harbor on Maui, for a little while. Gravel is being offloaded from the bottom of the boat by a crane and then put into that orange funnel-like structure. Then a truck drives underneath the funnel and the load is released into the bed and carried off. Yes, this port is for cruise ships, and for working ships, too. I'm going to have to get a little better at playing Chess. For my small doggie brain, this boardgame is somewhat complicated. 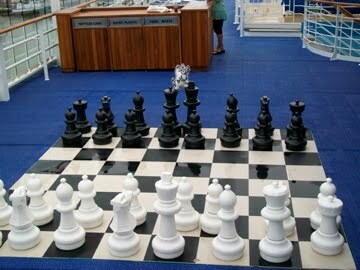 I'll just have to play more, or maybe I'll head to the deck across the way and play Checkers instead. Hmmmmm. Which one shall I choose? Here I am with the men who steer the Pride of America. Yikes, that's a lot of colored buttons! You must have to be very, very smart to navigate a cruise ship like this one. This vessel is HUGE! It holds 2,450 guests and they eat 18,330 lbs. of eggs each week (that includes the ship staff too)! It's like a small town! Jasper was the Activities Director for the cruise. He took great care of us! He took me down to the library to show me the collection. Isn't that cool, a library on a boat! This ship has everything, even a model of itself. There are many restaurants on the Pride of America. I had fun sharing lunch with Lyn and Carolyn in this old-fashioned diner riding in a big, red Cadillac! I enjoyed their jovial personalities the whole time we traveled. 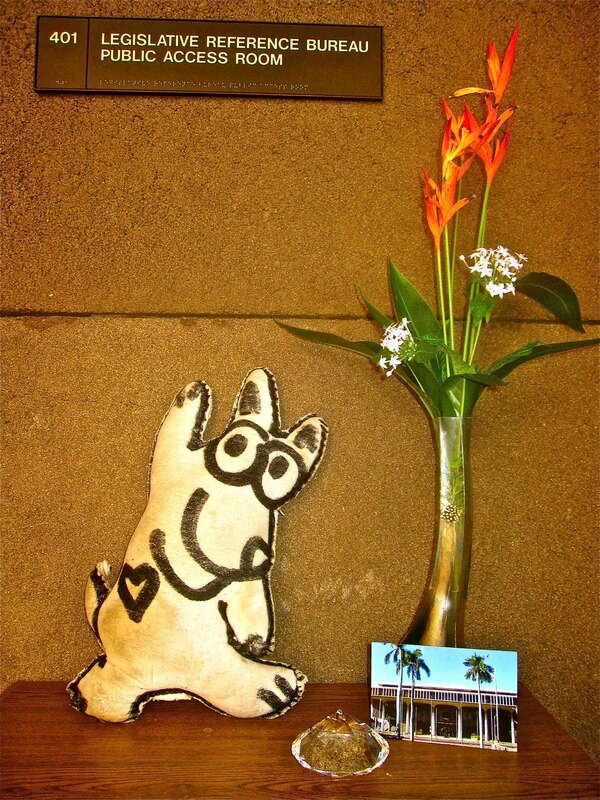 Now, I'm ready to go for another spin around the Hawaiian Islands anytime they want to go. Or maybe it will be the Greek Islands next time. We'll see. I'm keeping my paws crossed! I hiked to the top of the mountain behind Mom's school, Sunset Beach Elementary. This is the 1,100 acre parcel of land that the North Shore community fought hard to put in a land trust-----and succeeded! Isn't the view heaven!! Go to NorthShoreLand.org to learn more. Mark Munden builds homes with his son, Jed, on the North Shore and has lived in my neighborhood for many, many years. We're good pals. He came on the hike and showed me the right path to take! I like having friends who look after my well being. Thanks, Mark. Steve Albert is another one of my good friends at Sunset Beach. He likes being silly and making me laugh. He has a big heart too. 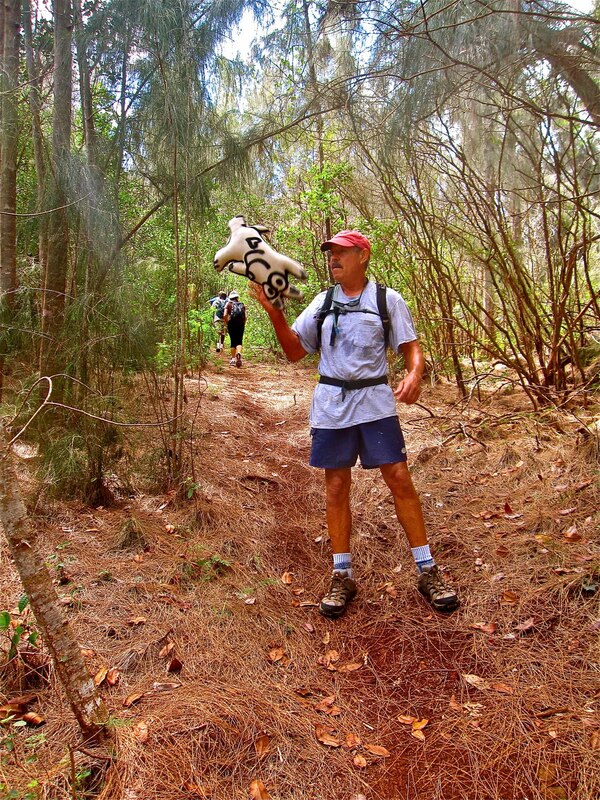 Hiking with friends is one of my favorite things to do, especially in Hawaii, and especially in my neighborhood! Hope you'll be able to join me some day. 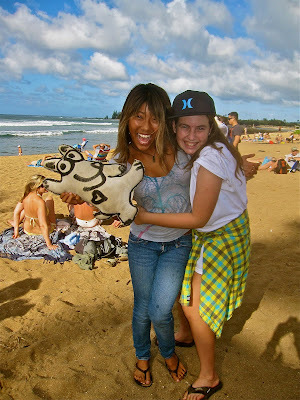 Mahina and Summer, in the cap, were all smiles at the Haleiwa International Open Surfing Contest. 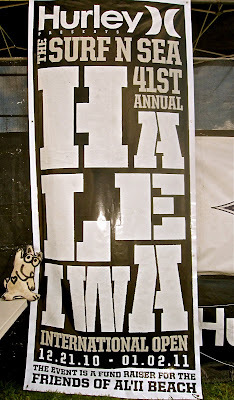 This event in the oldest amateur competition in the state. 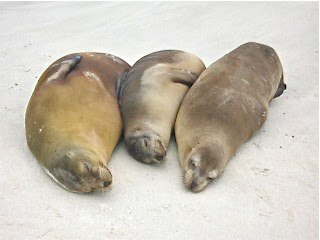 Mahina was a contestant and Summer's dad competed. Now, remember, it's the second day of January and look at the weather!! Lucky we live Hawaii!! Wouldn't you agree! I loved the banner for the contest!! The design is cool, in my little doggie opinion, of course! 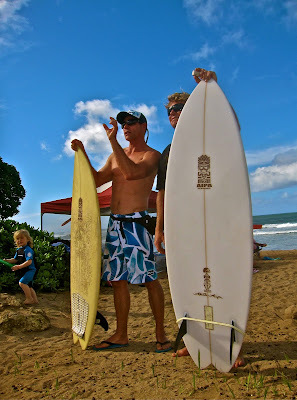 The Kowalski Brothers grew up surfing with their dad, Peter. Dylan, in the white t-shirt, competed in the HIO and took 4th place in the Men's Division. I asked him what his goal is for 2011. 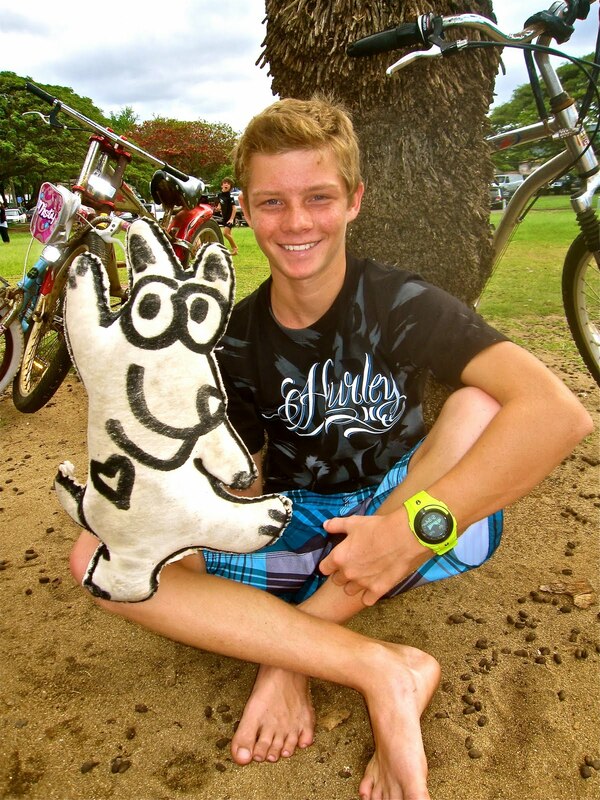 His reply, "I want to be in the top 5 of the Junior Pro so I can go on to surf in Bali and Australia next year!" Good luck, Dylan. 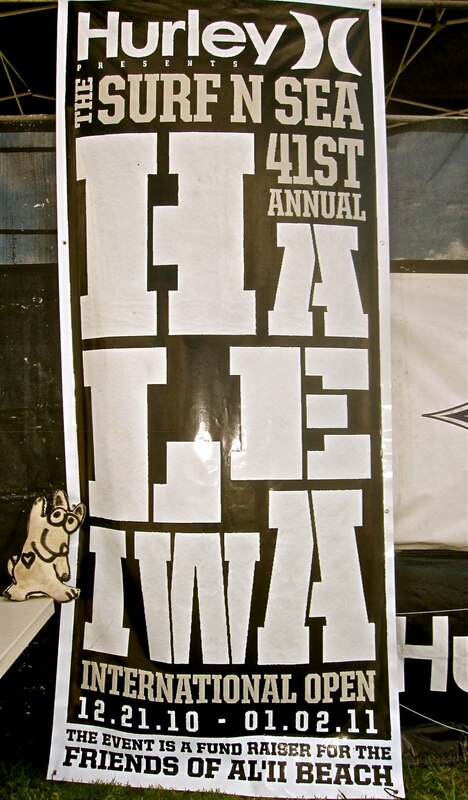 Taylor just graduated from college back East and was rooting his brother on at the Haleiwa contest. Michael Smith has been surfing this wave since his dad, Mitchell, took him out on a board when he was four years old. He loves this spot because, "When the swell hits just right, the wave peels to the right and makes a perfect bowl, just like a point break". Did Anyone See my Party Hat? John, with the short board, and Jason are old high school buddies. John flew in from the Mainland to attend Jason's son, Maddox's, 4-year-old birthday party at Ali'i Beach Park. Isn't it fabulous to have a summertime event in the middle of winter! 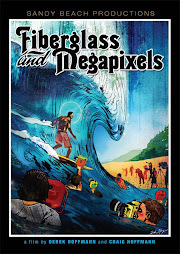 Did you notice the little surfer, also called a "Grom", in the background in wetsuit? Looks like he's charging for a wave. Yes, that's a trophy Sayuri is holding in her hand. She just won First Place in the Women's Division of the Haliewa International Open.